Rushing River Lodge is well appointed, beautiful and the perfect place for you to unwind, relax and rejuvenate. RUSHING RIVER LODGE: On the Coosawattee River. Hot tub. Fire pit. Fireplace. WiFi. Rushing River Lodge is one of those special cabins where the whole family can find their own special place. Whether is that quiet little reading nook you've been looking where you can unwind and relax your mind or the more social firepit where stories are told and smores are made in the evening, this cabin has them both. However, the lodge has a lot more to offer! The kitchen is completely outfitted with ALL of the equipment and dishes you will need to make those special meals as well the simple ones too. If your a coffee drinker, then you are in luck. There is a nice coffee maker and the expresso machine so you make your mornings even more glorious in these mountains. Imagine that steaming mug of java while you sit on the deck and watch the river flowing below, all the while the sound of the rushing rapids washing over you. It will surely be one of the best cups of coffee you have ever had! Once you have created your wonderful meal, you will have a fantastic table and chairs where everyone can gather to enjoy the fruit of your labors. This tastefully decorated dining room makes enjoying meals with family and friends a joy. The playful moose on the wall will be the talk of the hour while memories are made and flavors enjoyed. The living room boasts an amazing fireplace that stretches from the floor to the ceiling! 22 feet of fireplace rock that immediately draw the eye and warm the heart. The season for building indoor fires is from October to April, and the firelight dancing on the walls of the cabin while it is chilly outside and the Fall leaves dress the mountains, will be magical. And as if that wasn't enough, you can sit on the soft and cushy couches to enjoy the smart 50 inch TV with a fantastic sound system. There are three bedrooms and all are appointed nicely in a rustic chic motif. Please refer to the pictures since words cannot do the decor justice. There is a king, a queen and two bunks. The linens and towels are extremely comfortable and the towels are pristine and white. All of the linens are washed commercially so you know they are spotless, sanitized and clean. There are TVs located in the rooms with the king and queen size beds. There are two bathrooms and both have brand new, large style commodes. Additionally, as you can see the photographs, they are tastefully decorated and well lit. You can see well in these bathrooms so getting ready to out for a wonderful dinner in downtown Ellijay or Blue Ridge is much easier. Here in the mountains we do a lot of outside living, and this lodge is no exception. The master bedroom has an incredible, private balcony that opens up through a set of glass French doors and overlooks the Coosawattee River. The sound of the rushing river below carries right into the bedroom. There is a wraparound deck on the main floor that includes a grill, ample seating, a hammock and yes, you guessed it, a wonderful hot tub to soak away all of your cares! 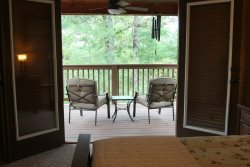 However, what is really special about this deck is that it overlooks the Coosawattee River below as it flows around some big boulders making a whooshing sound as it goes. Beautiful! The living room opens up to this deck via a set of glass French doors. Perfect for opening up the inside to the outside. There are some rustic and rugged stairs that will lead you down to the edge of the river where you can sit in one of the chairs and just look, listen and unwind. The Coosawattee River Resort, where Rushing River Lodge is located, has something for everyone. From fishing and hiking to swimming and playing in (and on) the river, this resort was made for creating memorable moments. As a guest staying at Rushing River Lodge, you will receive a Guest Pass for all the members of your party and these will get you into all of the amenities, so don’t wait another minute. With so many things to do in the resort, you might not find time to do anything else! We had to book last minute, so they were not able to prep/stage the cabin. The place was still clean and inviting. I was pleasantly surprised. We would definitely come back. Cabination was a great place to stay. The location was close to town which was convenient. Also, they had TONS of games, the hot tub, and trail down to the river were just nice extra things to do. We have rented different cabins for 5 years now for NYE and Cabination was by far the best! We enjoyed our stay there and would rebook again! Enjoyed our quick weekend get away. My family enjoyed their time in this cabin. This trip was all about spending quality time with one another and that is exactly what we did. This cabin met all my expectations and more. The location was great! We were able to do some hiking close by. The check in and check out process was very easy. I highly recommend this place! The check in and check out process was very easy. My family enjoyed their time in this cabin. This trip was all about spending quality time with one another and that is exactly what we did. This cabin met all my expectations and more. The location was great! We were able to do some hiking close by. I highly recommend this place! Very generous host. Basically, everything you need is there. The cabin was a great spot to corral all the local friends to catchup. The cabin will support 7 adults and a child reasonably well. There were some toys tucked away to entertain the young one. Also a TV with a roku box if you need Uncle Netflix to watch them awhile. There is wifi internet available for the digital junkies, but cell service is a fluctuating hit or miss regardless of carrier. There's a pool table (not the finest) and two tables up and down stairs great for throwing down board games. Screened in porch is great to sit and chat (and where the hot tub is) and overlooks the river. The river current is quite audible and great for muffling any loud talkers. You get complimentsry access to the resort center and there are things to do nearby, BUT we just stayed in the cabin 100% of the time as this was the intent of the trip (the rain also supported this). My recommendation is to bring some meals, chat, and relax. My only complaint is the lighting in the large common area. When we played board games and read some found it hard to see. We moved some lamps around to make it work though. We'd all definitely return in the summer to try out the nearby river tubing and mountain trails. Overall, a great place to catchup with friends and chill. Our hosts were informative, friendly, and helpful throughout the entire process. They provided excellent, clear instructions that made it easy to get in and out of our beautiful weekend home. Everything we needed to know about the cabin was included in the welcome folder they provided. TLDR: Everything you could ever want from a cozy mountain weekend. #cabingoals HOME Everything youd want for a cozy mountain getaway. Incredible views, a hot tub, a large TV (with the ability to play Netflix, Hulu, Amazon Prime Music, etc. ), a crackling fireplace, a spacious kitchen with everything you need for cooking hearty meals, comfortable beds... really, everything. The decor is cabin-y and quaint but also modern and calm. We brought all our own food (and a few specialty kitchen tools) and were able to cook a full Thanksgiving meal in this kitchen. The place settings they had were lovely and made our meal feel festive. After dinner, we played Cards Against Humanity and listened to Amazon Prime Music (on the TV) by the fire. It was seriously idyllic. Very hygge. We had two dogs with us (a GSP and a pointer/lab mix) and they had a blast as well. They liked going back and forth between the screened porch area and the living room (by the fire). LOCATION The location is incredible - simply walking around the mountainous neighborhood surrounded by multi-colored leaves was an activity in itself! The view of the rapid river is so awesome. We didnt go all the way down (one of our dogs did though ) but there does seem to be a path all the way down to the river. We were minutes from the Build An Ark Animal Rescue which was a highlight of our trip. Dont miss this quirky petting zoo/animal rescue when youre here! Although AWD might be preferable because of the hills (especially in the winter), you can get here easily with any kind of car. Its also worth nothing that we felt very safe in this gated community. HOSTS: Our hosts were informative, friendly, and helpful throughout the entire process. They provided excellent, clear instructions that made it easy to get in and out of our beautiful weekend home. Everything we needed to know about the cabin was included in the welcome folder they provided. Everything we needed (dishwasher pods, trash bags, remotes) was where it needed to be. We had a few questions (about grocery stores and hiking trails) and they gave us helpful recommendations. When it was time to leave, they allowed us to extend our checkout by an hour so we didnt have to rush out. They made everything easy for us! This home is really designed to provide a stress-free experience. TIPS: Bring your own: - starter log (to light the fireplace) - coffee/tea - refillable water bottles (water is clean and good to drink) - paper towels - toilet paper (we had enough, but you might need more for more people or a longer stay) - food (grocery store is about 20 min away) - Tupperware/ziplocs for storing food - laundry detergent - walking shoes! - dog beds (if bringing dogs) ACTIVITIES Take a walk around the neighborhood. It is beautiful! And definitely a workout because its very hilly. Go to the animal rescue! Its by the entrance to the community and is such a fun experience. You get to just hang out with the animals (llamas, donkeys, goats, horses, pigs, ducks, an emu...) and feed them carrots and apples. Be sure to say hi to Rascal, the amazing farm dog with spina bifida. She runs the place. Use the fireplace! A starter log makes this a lot easier (in case the firewood is damp). Come for more than a weekend! I couldve stayed here all winter. Absolutely beautiful home and view! We enjoyed our stay so much! We would love to visit again! It was a great place with lots to do had everything for kids and everything you will need. I have no complaints. The host was amazing and kept in touch will definitely be back! Its even better in real life than in the pictures! The decor is amazing and the beds are very comfortable. The kitchen has everything you need to make home cooked meals. The view and sounds of the river from the porch were my favorite parts. It manages to be both very spacious and very cozy at the same time. They warn you that your gps might not work well once you are close- after the gate make sure to follow the written directions that they provide for you (especially at night)! Great place, very secluded and everything was great! Thank y'all for letting us stay!